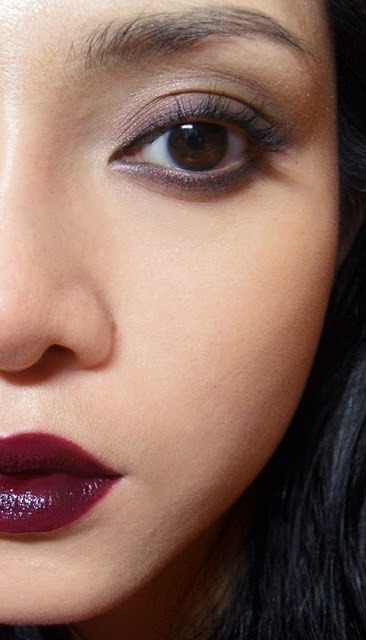 Pending a recent Fall look tutorial featuring Make Up Store's Black Orchid Lipstick (below), I figured it was time to feature a recent haul from the MAC Me Over Collection. Unlike the Seasonally Supreme and Styledrive Collections, this is a limited edition collection. The first, was Prince Noir Matte Lipstick. If you're in the market for a good, rich, dark black-plum shade, this is it. I did like Smoky Purple from the collection as well, but felt I'd get more use out of Prince Noir, which is a bit more red-based. If you have very sallow skin, Prince Noir would look better on you. Texture-wise, it is much more even going on than creamier black-plums. by virtue of the fact that it is matte and opaque. This means no lip liner is necessary unless you want a very heavy and dramatic mouth. Glossier textures tend to look streaky, and will need more effort to even out. The other product I got was Take Root Cream Color Base, an interesting, shimmery brown with an orange-toffee tone. Packed on thick, it's a deep ochre brown. Spread out, it gives an effect that I can only describe as caramelized. Swatched on thick, it looks like dewy red clay. As a translucent wash, it's delicious. The only thing is this might only work on those with lighter skin tones. If you're very pale, with blue eyes, this would look amazing as a smoky gleam on the lids. i know this post is a bit old, but i purchased Take Root based on your eye look- it's GORGEOUS, simple and chic. and i convinced myself that i would use it frequently. however, i'm not used to CCB's and i hear they crease easily and don't dry down, especially if you don't layer it with a powder, so i wonder how you felt it lasted and how thinly you blended it? THanks!! Hi Lissa, not odd at all! CCBs do crease a little, so what I do is apply it very close to the center of the lids near the lashes, and then spread it out very thinly (just a faint smoke) towards the crease so there's minimal product there. If I want more color and shine I layer a bit more near the lashes again so the color is more obvious but there is minimal product at the eyelid fold. There's no real way to eliminate slight crease forming after a few hours, but it's not too visible if you wear it thin. I just pat my finger along the crease lightly to smooth it out as and when. Hope this helps! thanks so much! that helps a lot. do you use a paint pot as a base or some shadow primer? and lastly, would the MAC 217 brush be good, or do you recommend something else? seriously it looks so simple yet that color isn't that easy to find and with brown eyes, it just looks chic. i think of the burberry ads where the girls have a brown smoky eye, it's just flawless on you! Hi Lissa, no actually I find it better to leave the lids as clean as possible before applying a CCB as the emollients in it will just end up breaking down the paint pot if you layer it. If (and ONLY if) you have really oily lids, you can try dusting some silica powder (Make Up For Ever HD or Coastal Scents silica spheres) only where your lid folds. But this may make the CCB look more matte. Brush-wise, 217 works for a softer, smokier look but will need a bit more blending. A firm flat shader like the MAC 242 (or Coastal Scents Deluxe Sable Blender - only $4.95) will smooth on the color faster and more precisely, and you can always smudge it out with your fingers.